Catered Cravings Brand offers a variety of gift boxes, gift baskets, care packages, and assorted candy options. One brand can accommodate all of your business, corporate, or birthday gift needs. Be sure to check out our entire selection by searching or clicking Catered Cravings brand near title above. 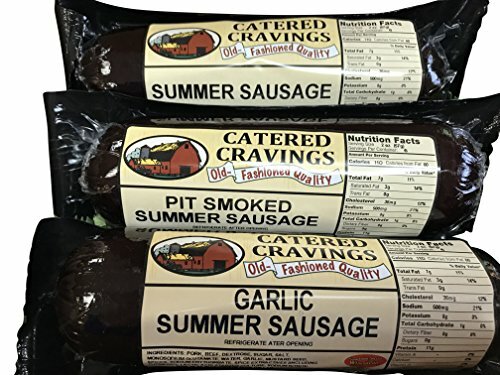 Wisconsin Made 3 12 Oz Stick Summer Sausage Gift Set. This Sampler Set makes a great corporate or business gift. Having a party? Make a quick sausage platter. Also makes a great employee, boss, co-worker, appreciation, and thank you gift. 1 12 Oz Pit Smoked Summer Sausage. 1 12 Oz Garlic Summer Sausage. 1 12 Oz Summer Sausage.